2010 Arctic Cat M8 162"
You were destined for a higher calling. Call it fate. Call it karma, you were born to take that mountain on the M8 162”. An all-new lightweight H.O. 800 laydown engine adiusts to temperature and altitude, giving you a range of arenas to play in. An independent 3rd party, DynoTech Research, easily saw 160 HP. That's 10% more HP than last year. 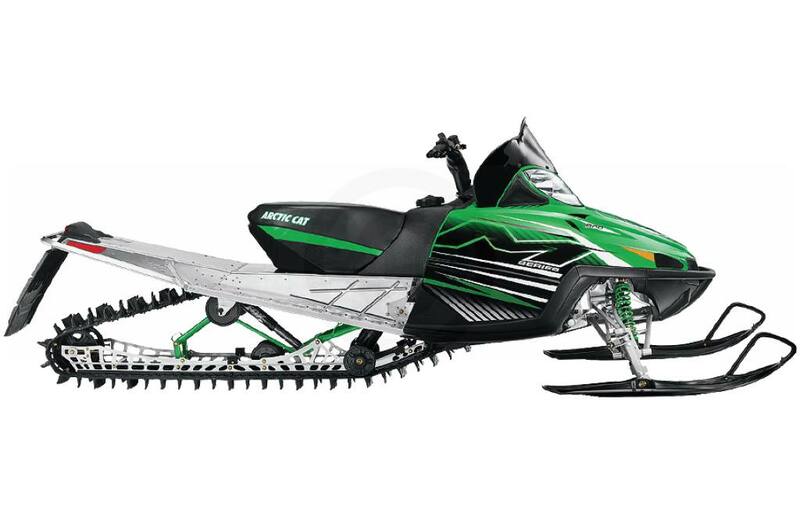 This Expert-Grade Mountain Sled also has the Industry-Leading Horsepower that you crave in a machine of this caliber. Its push-button engine reverse is slick, and shaves 8 pounds off your overall weight when tearing up that hill. The 15” wide, 162" long Power Claw™ track digs into deep powder like you're slicing through butter. Plus, the new lightweight running boards and FOX Float® rear skid make for a lighter machine without sacrificing superior strength. Add it all up and the M8 162” is the sled of choice for answering the call of the mountain. Fox Float® Rear Skid: Torsion springs are history. This redesigned frame decreases unsprung weight and reduces unwanted track tensioning. Two rear-mounted wheels inside the rails increase track flexibility and improve sidehill capabilities. The rear end is dampened with a lightweight aluminum FOX® Zero Pro gas shock on the front arm and a FOX Float® shock on the rear arm. H.O. 800 - The 800 engine is a 2-stroke, 794cc liquid twin with batteryless electronic fuel injection. An engine "laid down" in the chassis moves snowmobile mass toward the ground and effectively lowers the center of gravity. BEFI adjusts for temperature and altitude. In 2010, we've powered up every 800 engine for an increased 10% more HP over last year. An independent 3rd party, DynoTech Research, easily saw 160 HP. Engine reverse is also standard on the 800. There's also a new exhaust pipe, manifld, resonator and a lightweight crankshaft. Engine Reverse: Push—button electronic reverse gets even better. As a feature of the engine, not only is it quick, it's also a weight saver that sheds nearly 8 pounds. 162" Power Claw™ Track: The M Series Power Claw™ Track is nothing short of miraculous in the steep and deep and surprisingly well behaved on the trail. The 162" track is 15" wide with grabby 2.25" paddles. Lightweight Running Boards: The running boards with diamond-shaped cutouts reduce weight, disperse snow and impove foot traction. Width: 15 in. ; Length: 162 in.